In this episode, Brahima Sangafowa Coulibaly, senior fellow and director of the Africa Growth Initiative at Brookings, and Lemma Senbet, William E. Mayer chair professor of finance at the University of Maryland, explain why national debts in sub-Saharan Africa have risen in recent years, the challenges of sustainably financing economic development, and the role of multilateral development banks in solving Africa's massive infrastructure gap. This is the final episode of the Intersections podcast. Thanks to audio producer Gaston Reboredo, Chris McKenna, Brennan Hoban, Fred Dews, and Camilo Ramirez for all their support. Send feedback email to intersections@brookings.edu, and follow us and tweet us at @policypodcasts on Twitter. In this episode, Brookings Vice President Darrell West and Senior Fellow Camille Busette discuss themes from West's new book, "Divided Politics, Divided Nation: Hyperconflict in the Trump era," including the economic, geographic, racial, and technological factors that have exacerbated U.S. political polarization to its current breaking point, and what's needed to build a healthier democracy. West and Busette also speculated how these pressures may affect the 2020 presidential race. With thanks to audio producer Gaston Reboredo, Chris McKenna, Brennan Hoban, Fred Dews, and Camilo Ramirez for additional support. In this episode, Angela Stent and Keir Giles, authors of “Putin’s World: Russia Against the West and with the Rest” and “Moscow Rules: What Drives Russia to Confront the West” examine the history of Russia's national identity and how the U.S. fundamentally misunderstands Russia's view of itself in conflict with the West. With thanks to audio producer Gaston Reboredo, Chris McKenna, Brennan Hoban, Fred Dews, Camilo Ramirez, and intern Quinn Lukas for additional support. The Task Force on Extremism in Fragile States recently released its recommendations, calling for a new strategy to prevent violent extremism from developing in fragile states. Brookings Senior Fellow George Ingram and President of the U.S. Institute of Peace Nancy Lindborg explain why the U.S. needs to change its priorities from defeating terrorists militarily and focus on addressing the economic, social, and political weaknesses in fragile states which lead to the rise of extremist groups. In this episode, David M. Rubenstein Fellows Andre Perry and Jenny Schuetz examine past policies and current attitudes that have devalued homes and business in majority-black neighborhoods and the opportunities to be gained by building on the assets in majority-black places. In this episode, former Australian Prime Minister Julia Gillard, founder of the Global Institute for Women's Leadership and distinguished fellow with the Center for Universal Education (CUE), and CUE Fellow Christina Kwauk discuss the current state of gender equality in leadership roles, the pipeline from quality education for girls to increased opportunities for women in leadership, and the expanding the evidence on what works to challenge gender stereotypes. With thanks to audio producer Gaston Reboredo, Chris McKenna, Brennan Hoban, Fred Dews, Camilo Ramirez, and intern Tim Madden for additional support. In this episode, Todd Stern, senior fellow and former special envoy for climate change in the Obama administration, and David Victor, co-chair of the Cross-Brookings Initiative on Energy and Climate, discuss the key issues at stake at the COP 24 negotiations in Poland, the absence of U.S. federal leadership on climate, and the state of U.S.-China cooperation on climate and energy priorities. In between spikes of violence, the people of the Gaza Strip live in a state of perpetual crisis—a man-made humanitarian disaster of severe urban crowding, staggering unemployment, and a dire scarcity of basic services, including electricity, water, and sewage treatment. In this episode, CNAS Middle East Security Program Director Ilan Goldenberg, Brookings Center for Middle East Peace Director Natan Sachs, and Brookings Visiting Fellow Hady Amr lay out the recommendations of high-level task force for changing U.S. policy toward Gaza to help bring an end to Gaza's continued state of crisis. With thanks to audio producer Gaston Reboredo, Chris McKenna, Brennan Hoban, Fred Dews, Camilo Ramirez, and interns Churon Bernier and Tim Madden for additional support. Brookings Fellows Martha Ross and Elizabeth Mann Levesque discuss the important role that community colleges play in putting young adults on a pathway to higher-quality jobs and other strategies for improving economic outcomes for youth from lower-income and disadvantaged backgrounds. In a conversation with Natan Sachs, fellow and director of the Center on Middle East Policy, Distinguished Fellow Salam Fayyad, former prime minister and finance minister of the Palestinian Authority, and Visiting Fellow Jeffrey Feltman, former U.N. under-secretary-general for political affairs, assistant secretary of state for Near Eastern affairs, and career foreign service officer throughout the Middle East and North Africa, reflect on their days working together in Israel and Palestine in the 1990s and early 2000s. In addition to looking back, Fayyad and Feltman examine the current political environments inside the US, Palestine, and Israel, and prospects for the future of peace. With thanks to audio producer Gaston Reboredo, Chris McKenna, Brennan Hoban, Fred Dews and Camilo Ramirez for additional support. In this episode, Bradley Hardy, associate professor in the Department of Public Administration and Policy at American University and nonresident senior fellow in Economic Studies at Brookings, and Frederick Wherry, professor of sociology at Princeton University, explain how some economic policies have disproportionate impacts on black communities, and how that has to be understood to design better policies to combat regional economic inequality. In this episode, Dhruva Jaishankar, fellow in Foreign Policy at Brookings India, and Rush Doshi, post-doctoral fellow in Foreign Policy at Brookings, discuss the balance of power across the Indo-Pacific as China's influence grows and India seeks to increase economic connectivity and strengthen security relationships. In this episode, Isabel Sawhill, Brookings senior fellow and author of "The Forgotten Americans: An Economic Agenda for a Divided Nation," and Andrew Yarrow, senior fellow at the Progressive Policy Institute and author of "Man Out: Men on The Sidelines of American Life" look at two different groups of Americans forgotten by policymakers or sidelined from the U.S. economy and society. Sawhill and Yarrow examine the repercussions of growing disenfranchisement and skepticism among significant segments of the voting public, and offer policies to meet the needs of the working class and reengage men who find themselves on the margins of society. In this episode, Brookings experts David Dollar, senior fellow with the John L. Thornton China Center, and Joseph Parilla, fellow in the Metropolitan Policy Program, examine what effect the trade war has had on the U.S. and Chinese economies–and workers–so far. They explain why trade wars don’t actually reduce the trade deficit, which other countries might benefit, and what the prospects are for resolution between the U.S. and China. In this episode, Nonresident Fellow Witney Schneidman and David M. Rubinstein Fellow Landry Signé discuss how Africa's Continental Free Trade Agreement will transform trade across the continent, accelerate industrialization and economic development, and what it means for future commercial relations with the U.S., EU, and other trading partners. In this episode, Robert Kagan, author of the forthcoming "The Jungle Grows Back: America and Our Imperiled World," and Thomas Wright, author of "All Measure Short of War: The Contest for the 21st Century and the Future of American Power," discuss with guest host Will Moreland how the success of the post-World War II international order left it vulnerable to internal complacency and external pressure from authoritarian regimes. They explain how at the same time, Trump's longstanding disdain for global commitments finally found audience with an American public who have forgotten why the U.S. originally engaged in the system of international alliances and institutions designed to defuse the great power conflicts that led to two world wars. In this episode of Intersections, Vanessa Williamson and Elizabeth Mann Levesque review the Supreme Court's ruling on Janus v. AFSCME, which bars public-sector unions from collecting "fair share" or "agency" fees from non-union members to offset collective bargaining costs. Levesque and Williamson put the Janus case in the context of "right-to-work" legislation, the decline of private-sector unions, and the recent wave of teachers' strikes to assess how the decision will affect public-sector unions in the short term and future of unions' economic and political power more broadly. In this episode, Brookings Fellow Adie Tomer, CityLab's Tanvi Misra, and Route Fifty's Mitch Herckis revisit the themes of Infrastructure Week with an examination of historical patterns of urban and suburban planning that separated communities and discuss infrastructure as system for stitching communities together and creating access to opportunity. In this episode, Tamara Cofman Wittes, senior fellow with the Center for Middle East Policy at Brookings, and Steven Heydemann, nonresident senior fellow at Brookings and Janet Wright Ketcham ’53 Chair of Middle East Studies at Smith College, break down the difficult questions of how and when external actors should engage in reconstruction efforts in Syria without legitimizing the repressive regime of Bashar al-Assad. Bauer and Wicks also detail how using two specific measures - chronic absenteeism and college and career readiness - help teachers and administrators understand and improve students' education. On May 8, President Trump announced that the United States will reimpose sanctions on Iran, withdrawing the country from the Joint Comprehensive Plan of Action (JCPOA). In this episode of Intersections, Suzanne Maloney, senior fellow and deputy director of Foreign Policy, and Robert Einhorn, senior fellow in the Arms Control and Non-Proliferation Initiative, explain what this means for the continuation of the Iran deal, how sanctions will affect Iran's economy, and domestic political currents within Iran. When children as young as two and three years old are already facing significant gaps in their exposure to words, numbers, and spatial understanding, urban planners and child psychologists are developing ways to transform community spaces - from bus stops to supermarkets - into opportunities to augment children's education through playful learning. In this episode, Kathy Hirsh-Pasek, Stanley and Debra Lefkowitz faculty fellow and co-director of the Infant & Child Lab at Temple Univ, and Jennifer Vey, senior fellow in the Metropolitan Policy Program at Brookings, talk about these "learning landscapes" help reinvigorate public spaces for the whole community. Send feedback to intersections@brookings.edu, and follow us and tweet us at @policypodcasts on Twitter. Witney Schneidman and Yun Sun examine the shape of U.S. and Chinese trade and investment in Africa, Africa's growing regional economic power, and how both China and the U.S. weigh in on political as well as economic development in African countries. Send feedback to intersections@brookings.edu. Follow us on Twitter @policypodcasts. In this episode, Tanvi Madan, fellow and director of the India Project, guest-hosted a conversation between Distinguished Fellow Shivshankar Menon and Nonresident Fellow Joshua White on how China's deepening economic investments across South and Southeast Asia and India's own expanding presence are affecting the regional balance of economic and political cooperation and competition. In this episode, Jay Shambaugh and Jared Bernstein discuss the decades-long trend of real wage stagnation and policy solutions for increasing productivity, strengthening wage growth, and ensuring that national economic growth is reflected in the living standards of all American workers. For International Women’s Day, we’re showcasing the work of the Echidna Global Scholars – leaders from NGOs and academia who work to improve learning opportunities and outcomes for girls in the developing world. In this episode, Dasmine Kennedy, Armene Modi, Maria Cristina Osorio, and Damaris Parsitau talk about empowering some of the most marginalized girls in Jamaica, India, Mexico, and Kenya, and engaging their communities to invest in girls for wider social and systemic change. Some of the transition music heard in this episode was composed by Steven Lee and Gastón Reboredo III. In this episode, Camille Busette, senior fellow and director of the Race, Prosperity and Inclusion Initiative at Brookings, and Richard Reeves, senior fellow and co-director of the Center on Children and Families at Brookings, discuss the changing racial demographics of the U.S. middle class, political and cultural assumptions about the middle class, and what effect the increasing racial pluralism of the middle class may have on economic policy. In this episode, Stanford Professor Raj Chetty explains his new research that examines who becomes an inventor in America and who gets left behind, and discusses with Brookings expert Richard Reeves how innovation isn't a zero-sum game, and how inequality stifles American innovation. Bruce Jones, Jung Pak, and Ryan Hass discuss Kim Jong-un's strategic goals and the dynamics of the U.S., China, and South Korea in trying to denuclearize North Korea. For the last Intersections episode of the year, we're releasing a short conversation with Stav Shaffir, the youngest female member of Israel's Knesset, and Brookings Senior Fellow Tamara Wittes, held between sessions at the 2017 Saban Forum. Send questions or feedback to intersections@brookings.edu, and follow us and tweet us at @policypodcasts on Twitter. Itamar Rabinovich and Amos Harel discuss the state of the civil war in Syria, Iran's growing presence and what that means for Israel, and the changing relationship between the Assad regime and Russia. In this episode of Intersections, Haroon Bhorat, nonresident senior fellow with the Africa Growth Initiative, and Homi Kharas, interim vice president and director of the Global Economy and Development Program, discuss how the global trend of a rising middle class has played out in sub-Saharan Africa, whether a strong manufacturing sector is required for middle-class expansion, and the difference between reducing poverty and building economic security. Promoting inclusive economic growth in Washington, D.C. In this episode of Intersections, Amy Liu, vice president and director of the Metropolitan Policy Program at Brookings, and Jason Miller, nonresident senior fellow at Brookings and CEO of the Greater Washington Partnership, discuss the economic dynamics of the Washington, D.C. metro area, including the importance of regional cooperation, intentionality in building a long-term growth strategy, and what Amazon's HQ2 search tells us about how cities should think about their economic development. In this episode of Intersections, Brookings Senior Fellow Ted Piccone talks with former Secretary of State Madeleine Albright and former Prime Minister of Tunisia Mehdi Jomaa about the importance of liberal democracy in strengthening international security, and why states should encourage democratic participation among their people as a means to achieve greater domestic security. Who’s getting left behind in broadband internet access? In this episode, Brookings experts Adie Tomer and Elizabeth Kneebone discuss the findings from their new report, "Signs of Digital Distress: Mapping broadband availability and subscription in American neighborhoods," which examines the neighborhoods lacking in broadband infrastructure, and which ones have the infrastructure, but can't get connected. Darrell West, vice president and director of Governance Studies, and Camille Busette, senior fellow and director of the Race, Prosperity, and Inclusion Initiative, discussed the findings of the latest Brookings Financial and Digital Inclusion Project report, which measures how well individuals and families can access quality, affordable financial services in 26 countries around the world. This episode of Intersections features a discussion with Elizabeth Grimm Arsenault, author of "How the Gloves Came Off: Lawyers, Policy Makers, and Norms in the Debate on Torture," and Daniel Byman, senior fellow in the Center for Middle East Policy at Brookings, on how the U.S. came to reverse 200-plus years of progress on the legal and normative standards for treatment of prisoners of war during the Global War on Terror. While Intersections is on summer vacation, don't forget to tune into 5 on 45 and the Brookings Cafeteria, or catch up on some older episodes you might have missed. Thanks as always to Gaston Reboredo and Vanessa Sauter. Intersections will return on August 23. David Victor, co-chair of the Energy Security and Climate Initiative at Brookings and professor of international relations at the University of California, San Diego, and Christopher Clack, CEO of Vibrant Clean Energy, discuss the complexities of adopting sources of renewable energy, why the U.S. grid presents a unique challenge, and the political and economic challenges facing the pursuit of zero-carbon emission energy. Subscribe to Intersections here or on iTunes, send feedback email to intersections@brookings.edu, and follow us and tweet us at @policypodcasts on Twitter. William Gale and Vanessa Williamson discuss what can be learned from state-level experiments in taxation in Kansas and California, Americans’ feelings about paying their taxes, and the empirical evidence versus ideology on how tax policy affects economic growth. In this episode of Intersections, Benjamin Wittes and Jonathan Rauch, senior fellows in Governance Studies, address the importance of political institutions in relation to direct democratic participation and discuss their new report, "More professionalism, less populism: How voting makes us stupid, and what to do about it." Subscribe to Intersections here or on Apple Podcasts, and send feedback email to intersections@brookings.edu. During the 50th anniversary of the 1967 war between Israel and its Arab neighbors, Brookings experts Bruce Riedel and Samantha Gross detail the consequences of that struggle for Saudi Arabia and the Gulf states and the lasting reverberations for energy and geopolitical relations in the region today. Subscribe to Brookings podcasts here or on iTunes, send feedback email to intersections@brookings.edu, and follow us and tweet us @policypodcasts on Twitter. In this episode of Intersections, guest interviewer Ron Haskins, co-director of the Brookings Center on Children and Families, discusses changes in the social safety net and the role of cash assistance in meeting the needs of families with children with Luke Shaefer of the University of Michigan and Chris Wimer from Columbia University. Shaefer and Wimer present details from their upcoming papers on the costs and benefits of establishing a universal child allowance to provide families with a measure of financial stability. Subscribe to Brookings podcasts here or on iTunes, send us feedback at intersections@brookings.edu, and follow us on Twitter @policypodcasts. Visiting Fellow Philippe Le Corre and Robert Bosch Senior Fellow Constanze Stelzenmüller with the Center on the U.S. and Europe at Brookings discuss Emmanuel Macron's victory in France's presidential election, upcoming elections in the UK and Germany, and the need to reboot the European project. Subscribe to Brookings podcasts here or on iTunes, send feedback email to intersections@brookings.edu, and follow us and tweet us at @policypodcasts on Twitter. Adele Morris, senior fellow and policy director for Climate and Energy Economics, and David Victor, co-chair of the Energy Security and Climate Initiative, discuss how putting a price on carbon emissions is one of the most effective measures by which the United States and the international community can encourage global climate reform. Guest interviewer Esther Care, senior fellow in the Center for Universal Education, discusses with Ramya Vivekanandan, program specialist at the UNESCO Asia-Pacific Regional Bureau for Education, and Sean Slade, director of outreach at the Association for Supervision and Curriculum Development, how to transform education around the world to face the changing social, economic, and technological demands of the 21st century. Dany Bahar, fellow in Global Economy and Development, and Vanda Felbab-Brown, senior fellow in the Center for 21st Century Security and Intelligence, discuss how U.S.-Mexico relations have been affected by the Trump administration, misconceptions about NAFTA, immigration, and crime, and why taking an “America first” approach won’t help U.S. consumers. Jenny Perlman Robinson, fellow with the Center for Universal Education, and John McArthur, senior fellow in the Global Economy and Development program, address progress toward meeting the UN Sustainable Development Goals and explain how scaling up local development efforts enables the learning, data collection, and information sharing that make further progress possible. Charter schools and federal power: What’s next for education policy? Elizabeth Mann and Jon Valant, both fellows in the Brown Center on Education Policy, lay out the status of federal versus state powers in education, explain how charter schools work and how they perform, and provide insight as to what the future of education policy might look like in the new administration. Nicol Turner-Lee, a fellow in Governance Studies and the Center for Technology Innovation, and Evan Swarztrauber, the communications director at TechFreedom, explain the role of the FCC and Congress in protecting consumers and incentivizing internet providers for a digital ecosystem that is both accessible and competitive. Want a daily bite of analysis from Brookings experts on what’s happening with the Trump administration? Subscribe to 5 on 45 through your favorite podcast app for a quick hit of commentary on the day’s news. And don’t forget to follow @policypodcasts on Twitter for more updates. Amadou Sy, senior fellow and director of the Africa Growth Initiative, and Witney Schneidman, nonresident senior fellow at Brookings and senior international advisor for Africa at Covington & Burling LLP, examine the top priorities for Africa in 2017 set forth by the Africa Growth Initiative’s annual Foresight Report. With thanks to audio producer Gaston Reboredo and producer Vanessa Sauter, and also thanks for additional support from Kelly Russo, Fred Dews, and Richard Fawal. In this episode of Intersections, Molly Reynolds, a fellow with Governance Studies, and Thomas Wright, a fellow and director of the Project on International Order and Strategy, talk about President Obama’s successes and failures in public policy, and what legacy he leaves behind. Questions? Comments? Send feedback to intersections@brookings.edu, and follow us and tweet us at @policypodcasts on Twitter. Brookings experts Bruce Jones and David Victor forecast the future of U.S. energy and climate policies under the Trump administration, the role of state-level actors and energy markets, and what happens if the U.S. walks away from the Paris agreement. With thanks to audio producer Gaston Reboredo, Vanessa Sauter, Fred Dews, and Richard Fawal. Questions? Comments? Contact us at intersections@brookings.edu, or follow and tweet us at @policypodcasts on Twitter. Shibley Telhami, the Anwar Sadat chair for peace and development at the University of Maryland and nonresident senior fellow at Brookings, discusses with Sarah Yerkes the increasing polarization of American views toward Israel and Palestine and the future of U.S. policy in the broader Middle East. With thanks to audio producer Gaston Reboredo, Vanessa Sauter, Basseem Maleki, Fred Dews, and Richard Fawal. Richard Feinberg, nonresident senior fellow with the Brookings Latin America Initiative, and Ted Piccone, senior fellow in the Latin America Initiative, discuss the passing of Fidel Castro, U.S.-Cuba relations under a Trump presidency, and how tourism can be the driver of a new Cuban economy. Thanks to audio producer Gaston Reboredo, Vanessa Sauter, Basseem Maleki, Fred Dews, and Richard Fawal. Questions? Comments? Send feedback to intersections@brookings.edu. Amy Liu, vice president and director of the Metropolitan Policy Program at Brookings, talks with the former mayors of Philadelphia and Mesa, Arizona, Michael Nutter and Scott Smith, now both nonresident senior fellows at Brookings, about what motivated voters in their former constituencies and how a Trump presidency will affect issues of trade, immigration, and economic opportunity. Kemal Derviş, vice president and director of the Global Economy and Development program, and Bruce Katz, inaugural Centennial Scholar, examine the multidisciplinary, adaptive approach cities take to tackling public policy challenges, and other lessons for governance in the 21st century. Questions? Comments? Email us at intersections@brookings.edu and follow us and tweet us at @policypodcasts on Twitter. Please note: Intersections will be taking a break for the Thanksgiving holiday but will return on November 30. How should the next president counter violent extremism? As part of the Brookings Election 2016 project, the Brookings Podcast Network brings you a special edition episode in which Indira Lakshmanan, Washington columnist for the Boston Globe and contributor to Politico, moderates a conversation with Robert McKenzie, visiting fellow in the Project on U.S. Relations with the Islamic World, and Darrell West, vice president and director of Governance Studies, on ways in which the next president should address violent extremism in the United States and abroad. Diane Schanzenbach, senior fellow in Economic Studies and director of The Hamilton Project, and Grover “Russ” Whitehurst, senior fellow with the Center on Children and Families, discuss the importance of soft skills and the best policies and practices for teaching noncognitive skills to children. Guest interviewer Tanvi Madan, fellow and director of the India Project in Foreign Policy, Ambassador Shivshankar Menon, distinguished fellow in Foreign Policy, and Dhruva Jaishankar, fellow in Foreign Policy at Brookings India, examine India's foreign policy, particularly toward the U.S. and China, as well as its counter-terrorism approach in the wake of a cross-border attack on an Indian military position in Kashmir. Questions? Comments? Email us at intersections@brookings.edu. Alice Rivlin, senior fellow in Economic Studies and the Center for Health Policy, and William Galston, senior fellow in Governance Studies, discuss the importance of bipartisanship in the United States and how current party divisions are detrimental to the economy. In this episode of "Intersections," Richard Bush, senior fellow in Foreign Policy and the John L. Thornton China Center and director of the Center for East Asia Policy Studies (CEAP), and Cheng Li, senior fellow in Foreign Policy and director of the John L. Thornton China Center, discuss the recent elections in Hong Kong, the independence movement, and China’s one country, two systems governance policy. With thanks to audio engineer Mark Hoelscher, Vanessa Sauter, Basseem Maleki, Fred Dews, and Richard Fawal. Adie Tomer, fellow in the Metropolitan Policy Program, and Jeff Gutman, senior fellow in Global Economy and Development, discuss how to transform transportation policy with a focus on accessibility and how cities around the world are grappling with improving infrastructure and increasing access for people of all incomes. Thanks to audio engineer Mark Hoelscher, Vanessa Sauter, Fred Dews, and Richard Fawal. In this episode of “Intersections,” Kemal Kirişci, TÜSİAD senior fellow and director of the Center on the United States and Europe's Turkey Project, and Ted Piccone, senior fellow in the Project on International Order and Strategy in the Foreign Policy program, examine Turkey’s history of democracy and military coups, its relationship with the Middle East and the European Union, and the Gülenist movement’s relationship with the Turkish government. They also discuss the future development of the country’s governance under Recep Tayyip Erdoğan. With thanks to audio engineer Mark Hoelscher, Carisa Nietsche, Sara Abdel-Rahim, Fred Dews and Richard Fawal. In this episode of “Intersections,” Harold Trinkunas, senior fellow and director of the Latin America Initiative, and Dany Bahar, fellow in Global Economy and Development, discuss Venezuela’s political and economic crisis, and how it is the result not just of dropping oil prices, but of years of economic mismanagement. With thanks to audio engineer and producer Zack Kulzer, Mark Hoelscher, Carisa Nietsche, Sara Abdel-Rahim, Jacob Saliba, Fred Dews and Richard Fawal. In this episode of “Intersections,” Kenneth Pollack, senior fellow in the Center for Middle East Policy and Shadi Hamid, senior fellow in the Project on U.S. Relations with the Islamic World in the Center for Middle East Policy discuss the current state of upheaval in the Middle East, the Arab Spring, and the political durability of Islamist movements in the region. They also explain their ideas on how and why the United States should change its approach to the Middle East and areas of potential improvement for U.S. foreign policy in the region. With thanks to audio engineer and producer Zack Kulzer, Mark Hoelscher, Carisa Nietsche, Sara Abdel-Rahim, Eric Abalahin, Fred Dews and Richard Fawal. Subscribe to the Intersections on iTunes, and send feedback email to intersections@brookings.edu. In this episode of “Intersections,” Beth Akers, fellow at the Brown Center on Education Policy at Brookings, and Jonathan Rothwell, former fellow at the Metropolitan Policy Program and senior economist at Gallup, examine the current state of higher education by looking at student debt and its correlation to the value added for individuals with a college education. What colleges do for local economies: A direct measure based on consumption? In this week’s episode of “Intersections,” Tamara Wittes, senior fellow and the director of the Center for Middle East Policy, and Sarah Yerkes, a visiting fellow in the Center for Middle East Policy, discuss their experiences as women working in foreign policy, both in and out of government. They also shed light on progress regarding the active participation of women in foreign policy, while looking forward to potential improvements in order to promote more equality for women’s representation in government. In this week’s episode of “Intersections,” Laurence Chandy, fellow in the Global Economy and Development program, and Rebecca Winthrop, senior fellow and director of the Center for Universal Education, discuss progress toward meeting the Sustainable Development Goals of ending poverty and achieving education for all, and how digital technologies can be harnessed in that pursuit. Also, Winthrop and Chandy addressed the tools needed to reach the last 10% - those most marginalized. With thanks to audio engineer and producer Zack Kulzer, Carisa Nietsche, Sara Abdel-Rahim, Brionne Smith, Eric Abalahin, Fred Dews and Richard Fawal. In this episode of “Intersections,” Brookings experts Louise Sheiner, senior fellow and policy director for the Hutchins Center on Fiscal and Monetary Policy, and David Wessel, senior fellow and director of the Hutchins Center, discuss their new interactive game “The Fiscal Ship.” This computer game allows players to pick from a menu of tax and spending options to reduce the debt from projected levels over the next 25 years. Sheiner and Wessel also discuss the long-term changes in policy that could potentially boost the economy and reduce the debt in the future. How we picked the debt goal for "The Fiscal Ship"
How important is lowering the national debt? Subscribe to Intersections on iTunes, and send feedback email to intersections@brookings.edu. In this episode of “Intersections,” Brookings experts Elizabeth Kneebone, fellow in Metropolitan Policy Program, and Richard Reeves, senior fellow in Economic Studies, discuss their recent research on the multiple barriers and challenges that complicate the path out of poverty, and how different dimensions of poverty affect different people across the country. With thanks to audio engineer and producer Zack Kulzer, Carisa Nietsche, Sara Abdel-Rahim, Eric Abalahin, Fred Dews and Richard Fawal. “I locate the common roots of the rise of right-wing populism in globalization and technological change. You have a lot of people in Europe and the United States displaced, in the sense that they had decent standards of living and could count on that happening for their children...but that is in danger now” -- E.J. Dionne, Jr. In this episode of “Intersections,” scholars Constanze Stelzenmüller, the Robert Bosch senior fellow in the Center on the United States and Europe and E.J. Dionne, Jr., a senior fellow in Governance Studies discuss how economic grievances and political fragmentation are fueling the rise of right-wing political movements in the United States and Europe. Why the right went wrong: Conservatism from Goldwater to the Tea Party and beyond. “We have to tackle a lot of problems to get Americans the jobs and standard of living that they want to get,” Elaine Kamarck says. In this inaugural episode of our new podcast series, “Intersections,” join scholars Elaine Kamarck, director of the Center for Effective Public Management and Michael O’ Hanlon, co-director of Center for 21st Century Security and Intelligence as they sit down to discuss the real issues that the presidential candidates are and aren’t talking about during this election cycle. “All of us need the promise of growth and a better economic future, therefore we have to allocate our government resources and our government reforms towards servicing that central objective.” O’Hanlon and Kamarck address what presidential candidates should be focusing on in order to ensure they are responding to voters’ top concerns. With thanks to audio engineer and producer Zack Kulzer, Carisa Nietsche, Sara Abdel-Rahim, Fred Dews and Richard Fawal. Subscribe to the Brookings Cafeteria on iTunes, and send feedback email to intersections@brookings.edu. Economic recovery. Elections. Terrorism. Global poverty. Trade. Policy issues are complex and multi-faceted. Want more than the 30-second sound bite? 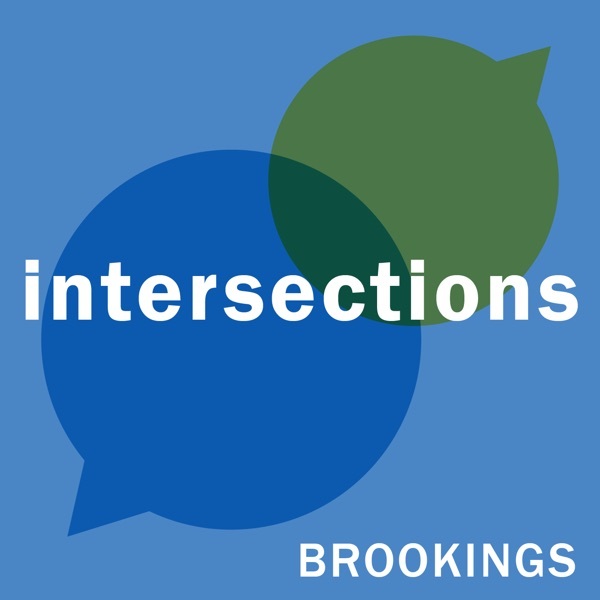 Tune in to Intersections, a new podcast from the Brookings Institution, where two experts delve into the varying angles of the complicated issues facing our nation and the world. Subscribe now and be the first to hear new episodes. Intersections is hosted by Adrianna Pita.